Caves of the Slovenský kras and Aggtelek karst region represent the joint natural world heritage of the Slovak and Hungarian Republics. This locality has been inscribed in the List of the World Heritage in Berlin in 1995 while the Dobšinská Ice Cave and the Stratená Cave were added to it in 1997. The entry depended on meeting the criterion viii), what means that the locality is an extraordinary example of ongoing geological processes and significant geomorphological phenomena. The region of Slovenský kras is a self-contained karstic area spreading in Slovakia and Hungary in the southern part of the Slovenské Rudohorie Mts. and consists of Silická, Plešivská, Konianska Zádielska, Dolný vrch, Horný vrch plateaus and the Jelšavský kras. The overall area of the territory is about 600 square kilometres. It represents a typical Central European plateau karst in the moderate climatic zone with almost all possible karstic phenomena: caves, abysses, karrens, dolines, dells, narrows, swallow holes and springs. The prevailing part of karstic phenomena is linked to the Mesozoic era. The plateaus are at the sea level altitude of 400-925. In so far known more than 700 caves and abysses different forms of sinter and ice filling are represented. The character of the landscape is determined by landforms, properties of the substrate and hydrology. Surface streams are missing as water percolates underground and forms caves by erosion of rocks. .
Flora – This the region is considered the one with the most abundant Pannonian flora which beside many other also contains the representatives of Onosma tornense, Draba klasterskyi, Cotinus coggyria, Erythronium dens-canis, Pulsatilla grandis Iris aphylla subsp. Hungarica, etc. Fauna ─ lower groups of the steppe and forest-steppe zone (endemic species, butterflies, beetles, etc.) occur here above all. 4. Singular density of representative types of caves in the moderate climatic zone. The Gombasecká Cave: It is located between the towns of Rožňava and Plešivec at the foothill of the Silická Plateau. The Krásnohorská Cave is situated near the village of Krásnohorská Dlhá Lúka. It is the type of cave with underground stream. Domica and Čertova Diera Cave (Original image): It is about 5,080 m long. Oval corridors with ceiling ravines prevail. Here belongs the most important archaeological site where the traces of the Forest beech Culture from the Neolithic era, (4,000 years BC) were found, including charcoal drawings and a lance from the Older Stone Ages (it is about ─ 35,000 years old). 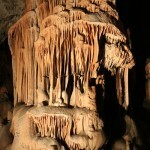 The cave system of Domica-Bradla is 25 km long (the greater part of it is in the territory of Hungary). 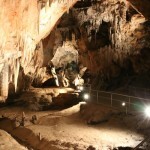 The Hrušovská Cave is near the village of Hrušov. It is rich in sinter ornamentation, and contains an underground stream. An archaeological site with finds of remains identified as those of a cave bear (Ursus spelaeus) and cave hyena (Crocuta spelaea). It was settled already in the Neolithic. 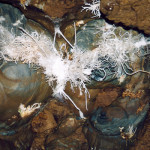 The Ochtinská Aragonite Cave is in the Revúcka Upland between the villages of ─ Jelšava and Štítnik. 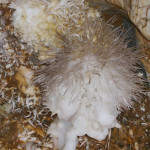 The lavish aragonite filling is the result of special hydrochemical and climatic conditions in the closed underground space and it occurs in kidney, needle and spiral shapes. Aragonite is still generated in the present time. The Dobšinská Ice Cave is remarkable for the occurrence of the permanent ice filling of bizarre forms, rare fauna and interesting history. Abysses like Diviačia priepasť (123 m deep); Zvonivá jama, Obrovská priepasť, Snežná diera and the system of Skalistý Potok are also part of the World Heritage territory.